By completing the survey you are helping St. Vincent de Paul to assess the spiritual engagement and individual commitment of its parishioners. 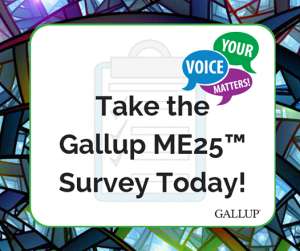 From Sunday March 24 – April 28 St. Vincent de Paul Parish will be asking parishioners to take the Gallup ME25 survey. By completing the survey you are helping St. Vincent de Paul to assess the spiritual engagement and individual commitment of its parishioners. This information will allow us to better plan, lead and minister to all.